The information presented on this page was originally released on July 31, 2008. It may not be outdated, but please search our site for more current information. If you plan to quote or reference this information in a publication, please check with the Extension specialist or author before proceeding. MISSISSIPPI STATE -- What comes first from the processing of corn − the ethanol in the car, the egg in the refrigerator or the enhancements in plastic lumber? Mississippi State University researchers think that one manufacturing process can produce materials for all three products at the same time. Commanding the most attention is ethanol, which is made from the starch in corn. The manufacturing process to make the fuel also yields a protein-fat-and-fiber byproduct known in the industry as distillers dried grains with solubles, or DDGS. This byproduct is used primarily as a nutritional supplement in cattle feed. A researcher with the Mississippi Agricultural and Forestry Experiment Station is working on a technique to separate the byproduct's protein, fat and fiber, and two other MAFES scientists are investigating potential markets for these materials in the poultry and forest industries. If the research ventures of bioenergy scientist Radhakrishnan Srinivasan, poultry scientist Alex Corzo and wood composites scientist Sheldon Shi are successful, rural communities that have benefitted financially from ethanol manufacturing may see more economic gains from sales of materials desired by other industries. Government mandates for ethanol use have strengthened domestic demand for corn and tightened the supply. Poultry mills are paying higher prices to secure corn needed for feed, and they are scrambling to find alternative sources of the protein and energy that corn provides. The DDGS could be an alternative ingredient, but its fiber is not well digested by chickens and not easily manipulated into the pellet shapes preferred by the birds. DDGS without fiber would serve as a plentiful, affordable source of protein and energy in poultry feed. The enhanced DDGS also would help mills contain their production costs. Forest products manufacturers also want to control costs. They would welcome development of alternative, inexpensive materials that add strength, durability, beauty and lightness to wood composites. The fiber yielded from the separation of DDGS may be a possibility as long as the material is pure. Any protein and fat left on the fiber could cause decay. Technology to separate the protein, fat and fiber in DDGS must be developed before new markets will open. Srinivasan has taken on this quest. 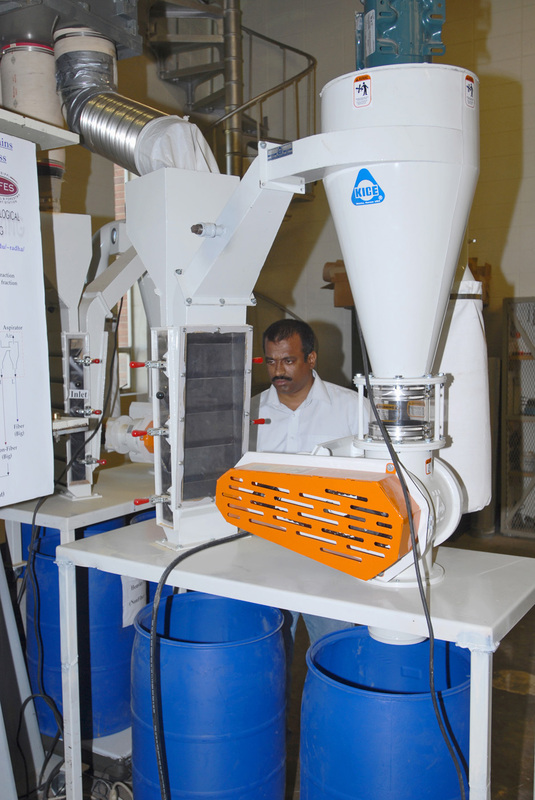 With support from MAFES and his department, Srinivasan built a pilot plant at MSU to test his separation technique, the “elusieve process,” on commercially produced DDGS. The technique is performed by sifting the DDGS particles into different sizes and then blowing them with air to remove fiber. The name is a combination of the words “elutriation,” or application of upward air flow, and “sieve.” Srinivasan's Web site, http://www.abe.msstate.edu/~radha/elusieve.html, contains videos and documentation. The pilot plant can separate the DDGS at a rate of 1 ton per hour into enhanced DDGS and fiber. Good separation of protein, fat and fiber has been achieved with commercially produced DDGS, Srinivasan said. Obtaining satisfactory results meant that poultry scientist Corzo could begin to measure the performance of protein and fat obtained with the elusieve process in poultry feed. Similarly, the finding also gave forest products researcher Shi an incentive to compare performance of the fiber with other fibrous materials used in wood composites manufacturing. In the first phase of his study, Corzo compared broiler performance using feed with unaltered DDGS, feed that contained enhanced DDGS and conventional feed. “We wanted to know how much of the nutrients in enhanced DDGS was available to the birds, how much of it they retained and how much quality improved,” said Corzo, an assistant research professor in the Department of Poultry Science. Performance of the chickens on feed with both forms of DDGS compared favorably with conventional feed. But the enhanced DDGS offers the advantage of helping eliminate the digestive and manufacturing problems the fiber causes. Corzo has been working with poultry feed mills to test the effect of enhanced DDGS on the manufacturing process. He is assessing the research data. The availability of fiber from the elusieve process also has moved the research effort with wood composites one step forward. Shi is planning to investigate how DDGS fiber can be used with wood powders in polymer composites to improve water and weather resistance. If processed appropriately, the fiber also has potential to improve bonding between natural fibers and polymers, and to provide pliability for molding and shaping. One of the problems Shi identified in his preliminary work is the possibility of extremely small amounts of protein still on the fiber after separation. Protein can affect the ability of the fiber to resist the high temperatures of composites fabrication.